Along Came A Spider | My Journey So Far…. 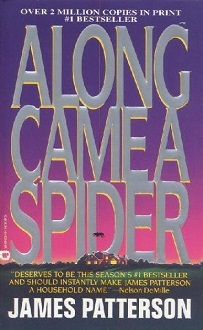 A thrilling, fast paced novel filled with gory details., but this is not all which can be said about James Patterson’s famous novel “Along Came A Spider”. For the lovers of thrillers and psychotic characters, this could be among the best choices, but if you are not very fond of insane characters, than go take a nap instead. This novel takes a very good start by building the very gruesome foundation for our psychotic character Gary Sonezi, who starts off by kidnapping and killing an infant mercilessly. You can guess easily what he is capable of doing, if he starts his killing spree in such a sick way. To match this psychotic killer we have our very own hero in the form of Alex Cross, the famous homicide detective who is determined and passionate about his work. Main plot starts off with kidnapping of two kids, one girl Maggie Rose and her friend, Shrimpie as known popularly . What makes this kidnapping, a crime of the century, is the fact that both the kids belong to the affluent families, one being kid of a celebrity and other one of treasury. In-fact the kids had their own personal bodyguards assigned to them by the secret services for protection. Alex Cross is assigned to solve this kidnapping, along with Jezzie, from the Secret Services, who later becomes his love interest too. The mastermind of kidnapping, Gary Sonezi is shown as a cruel and devilish person, who has no remorse or soul, indeed he is a brilliant plotter who is always two steps ahead of Cross and whole bunch of secret service personnel. He comes across as one who makes backup plan, of a backup plan. Still he was caught in a very dramatic way. Later, however it does looked like, that this was also a part of his terrific plan. Their is one interesting twist to the whole story, when even the kidnapper got duped by some opportunists. Incidentally Gary Sonezi, trusts Alex Cross to solve the final mystery more than himself or the police. Their is also a dramatic turn of events with a double personality disorder, which was actually being shown marvelously. Now, coming to the points where this novel lacks, is number one it is pretty boring in the second half. It seemed to stretch beyond a point making it dull and heavy. At one point you just want to put down the book, but you are hanging only to see if Gary received the punishment he deserved. Romance is exaggerated and in such a boring taste. You can yawn easily between the love making sessions. They talk as if no two lovers or even normal persons talk to each other. What disgust me about this novel is the Racism card, which was played over and over. Their was no such need to glorify it or to make it such a big deal. It was like getting distracted by something which is so out of place for this kind of a book. Only thing that this book needs is a better editing.Rest, it is a marvelous story told beautifully. Previous PostSummer spiritNext PostWhat Kind of Government We Want? Pingback: When a Tortoise decides to Cross the Road | My Journey So Far…. Pingback: Can you kill a Spider, Mom? | My Journey So Far…. Pingback: ILLUSION (Review): Book by Frank Peretti | My Journey So Far…. Pingback: Tuesday Talkies – Guardians Of The Galaxy | My Journey So Far…. Pingback: Frolic Friday – When Deepika’s Cleavage became National Point of Interest | My Journey So Far….